Sale Sharks Supporters Club have once again made a considerable donation to Sale Sharks Academy to help fund this year's pre-season tour to North Yorkshire, developing U16 & U18 morale and essential skills. Including pre-season 'friendlies' v Falcons & Ulster. With the final figures now available for participating academy players travelling on tour now being 83 the SSSC have increased our donation to a final figure of £6,750.00 to help cover increased costs. Brendan Thomas - Sale Sharks Academy Manager received a cheque for £6,750 from Joe Parsonage - SSSC Chairman. The presentation was made at the Sale Sharks Season Ticket holders Open Day / BBQ at Carrington High Performance HQ on Saturday, 7th July 2018. Sale supporters heading down to Franklin's Gardens on Saturday 11th October are advised that Northampton are planning that the match should be a commemoration of the life of young Saints supporter Luis Ghaut who sadly passed away last week at the age of 13. Luis had fought a brave battle against Osteosarcoma, a rare bone cancer and over the last year or so had grown very close to the Northampton players and staff. Highlights included leading out the team for last season's Premiership Final at Twickers. In the words of one tribute left on Twitter, 'not many 13 year old boys can claim to be a hero to their heroes but Luis Ghaut could'. Luis and his family have been fundraising for Sarcoma UK and as well as passing on our condolences to his family, the SSSC have made a donation of £100 in his memory. The Sale Sharks Community Department have joined us in passing on their condolences and have donated tickets to the return match against Saints at the AJ Bell in January which can be raffled off to raise funds. SSSC donate £1000 to 'West Coast Crash'. On Friday evening Sale Sharks Supporters Club invited 'West Coast Crash' to AJ Bell Stadium to witness Sale Sharks' 15 - 3 victory over London Irish. As part of our ongoing commitment to support the North West’s National Wheelchair Champions SSSC presented the charity with a cheque for £1000. 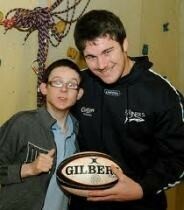 SSSC Donation to Kieran's trust fund. In the photo, amongst Crew & Nantwich friends and supporters were (L to R) Tony Buckley and Tom Holmes, Roger Bowen (Chairman - SSSC) presenting a cheque to Jon Cockburn (C&N Chairman) and SSSC committee members Joe Parsonage, Sandra Smith (Treasurer) & Adrian Seddon. A bucket collection was held at the Worcester Warriors match at the AJ Bell stadium. The collection raised £1463.05 towards the trust fund set up to help Crew & Nantwich centre, 20 year old Kieran Flynn. Kieran had a catastrophic accident when he broke his neck in a pre-season rugby match. Unfortunately he has recently learned that he will not recover feeling below his waist and will be confined to a wheel chair. His courage in the face of this devastating injury is frankly quite humbling and we, the rugby family, have rallied around this brave young man. To all those who contributed.... A very big "Thank you" for your genorosity! It means so much to Kieran and his family! 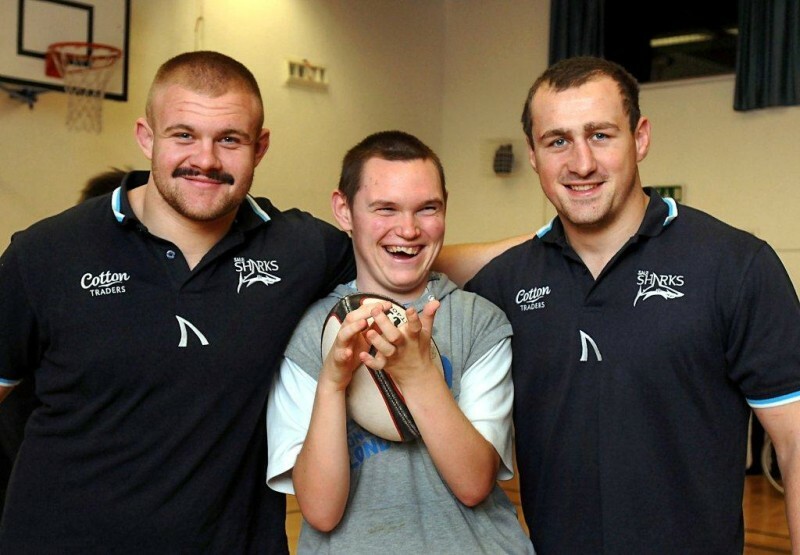 The collection was organised by Sale Sharks Supporters Club in collaboration with Sharks Community Trust. Members of the SSSC committee and Kieran’s team mates and friends from Crew & Nantwich Rugby Club manned the buckets throughout the stadium. The SSSC also presented a cheque to Jon Cockburn, Chairman of Crew & Nantwich RUFC, on the pitch at half time to the value of £250 towards the fund. Sharks Academy receive 2nd 'Trauma Kit' from SSSC. Sale Sharks Supporters Club presented the Sharks Academy with a ‘Trauma Kit’ at half time at the Bath game. This additional Trauma Kit is to protect the well being of our Academy U18 players on match-days. At a cost of over £4000 the Supporters Club consider this to be money well spent! The SSSC committee has conducted a review of our charitable contributions. Our membership is fairly diverse with many different interests in life, bound by a common love of rugby and Sale Sharks. The same can be said of our members charitable preferences, which I’m sure are just as diverse. We feel that as a rugby supporters club, our charitable contributions should reflect this common love which bonds us all together. The SSSC is therefore delighted to announce our new charitable partner, the North West Wheelchair Rugby Charity (Reg: 1070676). 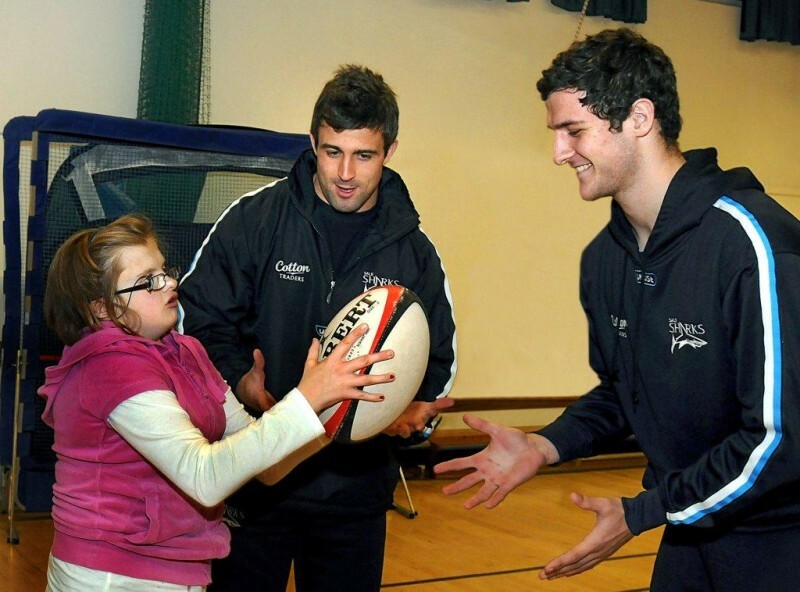 Based at the North West Spinal Injuries Unit in Southport, the charity promotes the sport of wheelchair rugby and provides an avenue for rehabilitation through sport as well as providing sporting opportunities for people with a disability. The charity operates the West Coast Crash team and last season won the national league title for the 1st time. Following the success of the London 2012 Paralympic Games, the league has expanded this season to 2 divisions and the charity will operate a team in each league. We are marking our new partnership with a donation of £250 worth of equipment for the team - a new tool kit to maintain their specialised wheelchairs and spindles and tyres for the chairs. We invited members of the team to join us at our home match against Harlequins (Friday, 22nd﻿ February) and presented them with the equipment on the pitch at half time. Amongst those attending was Crash player Myles Pearson who represented team GB at London 2012. Anyone looking for more information or the latest results of the North West’s only wheelchair rugby side in the national league can go to their website at www.westcoastcrash.co.uk or follow them on twitter: @wccrashwrc or on Facebook: West Coast Crash Wheelchair Rugby. Donation to the 'Seashell Trust'. At the AGM on 2nd October 2012 the outgoing Treasurer, John Mills-Flynn proposed that a donation should be made by the Supporters Club to the Seashell Trust in the sum of £1000. The motion was carried and a cheque was forwarded to the trust. Sale Sharks Supporters Club presented £2,400 worth of ‘Technical Equipment’ to Ray Unsworth, Academy Manager which will greatly benefit training and coaching facilities at Carrington for the Jets & Sharks Academy! Visit to the Seashell Trust by SSSC representatives and players to meet some of the children in their care and to present a cheque on behalf of Sale Supporters. Angela Traynor SSSC, Chris Leck, Mark Jones, James Gaskell, Carl Fearns, Lee Imiolek, Graeme Bowers SSSC, Ben Roberts, Tom Brady, Rob Miller & Will Cliff.